Over the summer, the quilts for the high school graduates were completed. Lola’s quilt was finished up about 5 miles from moving in. Pictures were not taken after the quilting was complete. She brought it home for the Thanksgiving break. There was a string on the back that her toe caught on….a “toe picker”. Sometimes these are extra large stitches from not having a stitch regulator. This one is from a couple stitches that looked like they popped and the back thread was still intact. The quilting motifs include meandering in the strip piecing, why take the time if it will not show. All of the outside purple is “Baptist Fans”. These are fairly small. The inner purple diamonds are from a pattern found in “Heirloom Machine Quilting” by Harriet Hargrave, page 161. The pattern was slightly altered to fit in the allotted space. The back is an orange flannel batik. On Wednesday was MJJR’s birthday. Over the years, her birthday dinner is either turkey, leftover turkey, turkey potpie or some other turkey dish. For her birthday she requested crab legs for Thanksgiving dinner. Our leftovers might be slim pickings….they will be gone by tomorrow. It was just the 4 of us for Thanksgiving dinner so it was no big deal not to do much cooking. We went for a ride last night. Not really shopping…dropped a couple pictures off for framing….more realistically…..we people watched at the 3 Wal-marts in our area, Best Buy and the people waiting to get in at Old Navy. I drew a name this morning. Yesterday after I left my last day of work….I did a little Christmas shopping, had my nails done, did a little Christmas shopping research, went out to dinner, watched 2 basketball games about 20 minutes from where I was at, arrived back home at least 45 minutes later and dropped dead from tiredness. So this morning I drew the name… and the winner is…. Congratulations on the change in your life, hoping you find a fulfilling way to use your education! The email is sent and the package is awaiting postage. Well, today is my last day of work. I have a giveaway going on to be drawn tonight. Stop over and put in an entry. Currently I am working on testing a pattern for a long time blog buddy, Canuck Quilter. I just love how her sashing turns the simplicity of a postage stamp block into an amazing quilt. I started yesterday I worked on all those postage stamp size squares. I have enough for 4 blocks so far! Stop over to Connie's blog and check out others on her Linky Tuesday blog post. DH had a business dinner out of town. He took me to the big city for a little jaunt…..over 1500 miles in 24 hrs. This was the breakfast view this morning. This afternoon back to the quilt. This is needed for a Benefit on November 30th. The binding is being put on by the top maker, so I need to keep working. I wanted to show just a bit of how I did the loop-d-loo’s. These look way harder than they are. First draw a line with something that can be removed later, my favorite is a grey pencil. Stitch along the line you drew. You do not have to hit the line exactly….once the line is gone no one but you know whether you hit it dead on. Stitch the loops back along the line so the connection lands on the line you stitched. As you look at my sample some fall above the line, some fall below the line and some hit. Remember the overall look is more important than each individual stitch. The tension will be better is you don’t rush, I tend to rush at the top of the loop, try to slow down at the top. After the loops are done, stitch another straight line and use your foot edge to keep a consistent width between the lines. Follow that line up with the loop-d-loo’s back down the line. To alter the pattern, try different size loops, different distances, or something besides a loop (hearts or leaves work). I am making sections with the double lines and loop-d-loo’s and filling in the sections. So far the sections include Baptist fans, meander, spirals and now the “railroad” looking thing above. It is nice to be home, but after 2 long days in the airports, I am off to bed. Here is the latest quilting project. The top maker requested the bright raspberry thread. Goods and bads to that...you can see every stitch. I like the results so far. What do you think? Check out the other links at Linky Tuesday. One of the things that I want to achieve with the new schedule of no work…more charitable activities. Here is this years Christmas Traditions Quilt. Traditions is 3 weeks away and this is the earliest we have ever finished the quilt. Our guild supplies 1000 doll quilts each years to the different local organizations. Here are a few that just needed quilting. 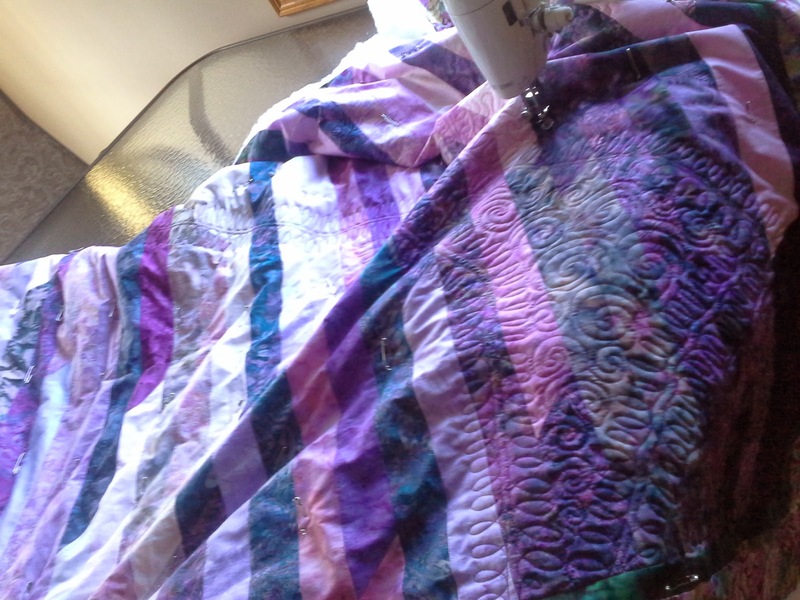 It is a great chance for me to work on my free motion quilting and some more to be finished before the end of the year. Here is my work for the day.....The picture does not do justice to these beautiful intense batiks. These are great plums, lavenders and eggplants. This gorgeous 1600 quilt a friend/coworker made and is going to a benefit for another coworker. She has had several strokes and is young with a family. The benefit includes trivia night and auction items and is scheduled for November 30th, so I better get to it. Stop over to Judy L's. That Patchwork Times and check out the other design walls. I can’t believe that it has been so long since I have posted. So much has happened that kept our family busy. I have certainly lurked and am up to date on all the blogs. So the biggest news first…..I quit my job. I work 2 more times and then I am done. I have worked for the same company for 20 years. I have 5 years of schooling and always wanted to put my education to use. My husband has a good job and I do not need to work. Because I have always enjoyed work and loved the stimulation, I have stayed. In the last few months (since February), the work has become more monotonous and the schedule more unpredictable. I did not sign up for concession stand duties for fear it would be one of the few days I might work. I needed a change. I need to find something to do…another job (Lola is disappointed I did not have a job before I quit my job. ), volunteer hours or something to just keep myself motivated. I am starting here! Here are most of the graduation girls and their quilts. All were done before each arrived at college…Lola’s about 5 miles from campus. I did some gardening…I had 2 of these. And since you made it to the end of the blog….to celebrate the ending of an era…I am having my first giveaway. This pattern was used for my Brown & Turquoise Diamonds quilt. The pattern, 2 fat quarters and a spool of matching Aurifil thread can now be yours. To enter leave a comment for an entry and “follow” me for another. The drawing will be on Tuesday, November 26th…my last day of work. US entries only please. Be sure that I can get to your email information. Happily Quilting on my own time.